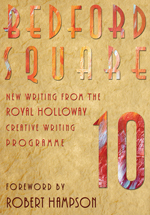 Bedford Square 10 features the latest writers to emerge from the prestigious MA in Creative Writing founded by Robert Hampson and Andrew Motion at Royal Holloway, University of London, in 2004. Masterclasses by acclaimed novelists, poets and editors have been introduced, with Helen Dunmore, Adam Foulds, Charlotte Mendelson and Daljit Nagra invited to inspire and advise the writers in this volume. This year’s teaching team included Susanna Jones, Nikita Lalwani and Anna Whitwham for Fiction; Jo Shapcott, Kei Miller and Karen McCarthy Woolf for Poetry; and Redell Olsen and Robert Hampson for Poetic Practice. Together they continue to play a key role in identifying, nurturing and launching the careers of some of the most talented new voices in contemporary fiction and poetry.